Gosh! It's January now and this means that Chinese New Year is arriving soon!!! Gotta kick start baking Chinese New Year goodies soon!!! 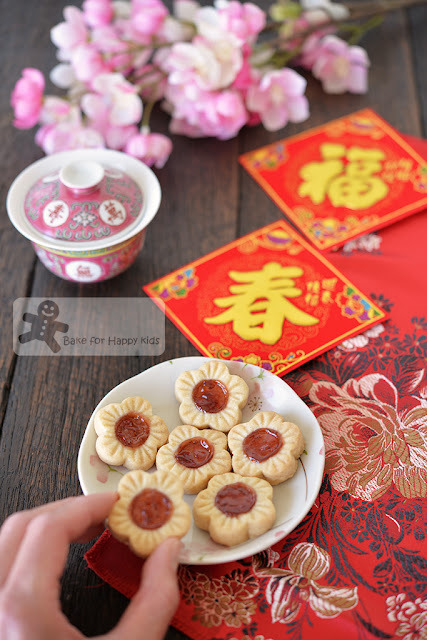 Have you been busy baking for Chinese New Year too? NO? Is it because you have experienced bad failures from baking and don't want to go through the stress and pain of not being able to deliver any delicious bakes on important celebrations like Chinese New Year. I know this feeling... I was a lousy cook and baker too but I have changed!!! I have managed to learn well enough as I cook and bake. Oh yes... I'm a strong believer of "practice makes perfect". So, don't give up!!! If you are afraid of baking failures but still keen to bake for Chinese New Year, I have a really good fail-proof simple and easy Butter Cookies recipe to share with you. 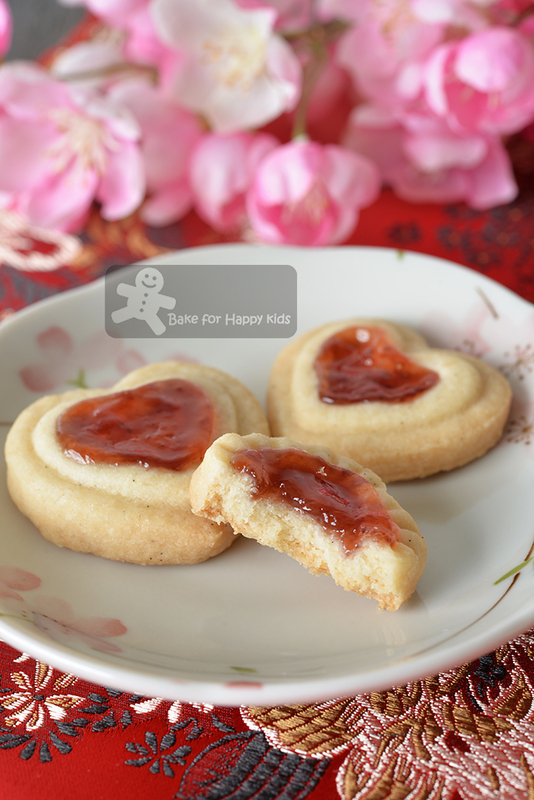 And you can bake these easy-to-handle sturdy butter cookies with or without strawberry jam or even with any jam. Keen to try? YES??? So easy that I think anyone older than 12 can bake these cookies! Why is this recipe fail proof and easy? With the right proportion of butter, sugar and flour (including cornflour), this recipe makes cookie dough that is extremely easy to handle, before and after baking and I didn't even need any extra flour to dust my hands when I'm shaping, rolling and cutting the dough. Plus, the dough is so stable that I don't even need to rest or chill it. Due to the fact that the cookie dough is soft, pliable and easy to handle, I can shape the cookies anyway I like! I can either roll and cut the cookies or roll the dough into round balls and use my thumb to make an indentation in each ball. Despite the addition of baking powder, these cookies will puff up slightly and will be nicely baked to become delicious cookies. Even better than they won't expand much after baking resulting the cookies still looking so pretty before and after baking! What's more? Although these cookies are made with NO eggs or egg yolks, they are actually amazingly structurally stable. So sturdy that they can be easily stacked and transported in cookies jars with absolutely no worries! Yes but only two very important tips! Tip One: Please stick to the amount of butter, sugar, flour and cornflour added in this recipe! If you follow my recipe to the tee, I'll be surprise if you say that you can't bake these cookies as I say that this recipe is rather fail proof. Hence, please do not reduce the amount of sugar added in the cookies. 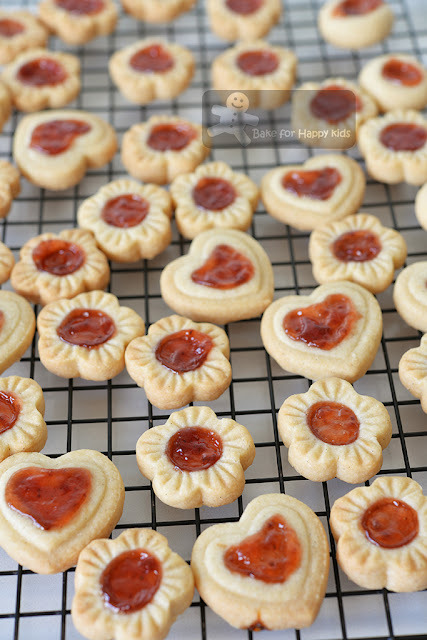 To reduce sweetness of the cookies, you can either add 1) no jam or 2) less jam or 3) jam that is less sweet. If you are baking these cookies with homemade jam and want to keep for more than 2 weeks, please make sure that the homemade jam is made with full amount of sugar to avoid the cookies from getting moldy easily. Tip Two: Please do not use butter that is too hard or too soft. Semi-soft butter is the best to use for this recipe. Do not over-beat the butter, sugar and vanilla mixture because over-beat the mixture will make the cookies puff up a lot more during baking and might ruin the shapes of these cookies eventually. This cookie dough is so easy to handle. So easy that I can literally bake them into any shapes that I want. I can shape the cookie dough by hand by rolling into balls and fill their center with jam. 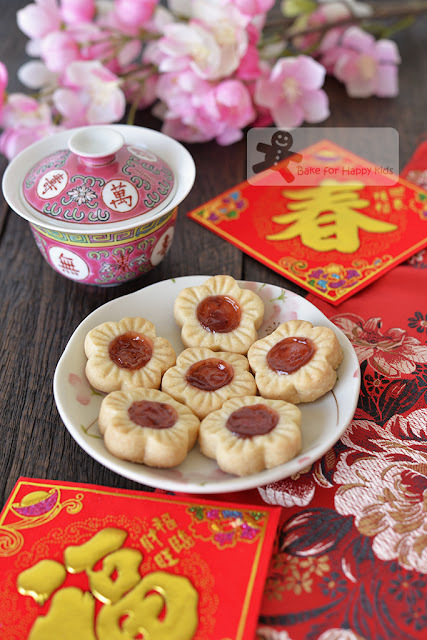 Are you convinced now that you can bake these easy butter cookies for your Chinese New Year? Yes? Then bake these eggless butter cookies!!! Not just because they are easy to bake. They are very delicious too! Here's a video to show how I baked these easy strawberry jam butter cookies. 125g (1/2 cup) unsalted butter, semi-softened at room temperature - please see the above baking tip 2. 50g (1/4 cup) caster sugar - please do not reduce this essential amount any further. Preheat oven to 180ºC / 350ºF or 160ºC fan forced. Line baking trays with baking paper. Use a wooden spoon or an electric mixer with paddle attachment, beat butter, sugar and vanilla for 1-2 mins until just combined and creamy. Do not over-beat. Sift flour, corn flour, salt and baking powder into the butter mixture. Use a spoon or spatula to mix and then your hands to knead mixture until a soft pliable dough forms. Do not over-knead the dough. This cookie dough is very easy to handle and so you don't need any extra flour to dust your hands and rolling pin. Use a rolling pin to roll dough into flat dough with a thickness of 1 cm (1/2 inches) and use any small cookie cutters (size is about 3-4 cm) to cut the rolled dough into shapes. 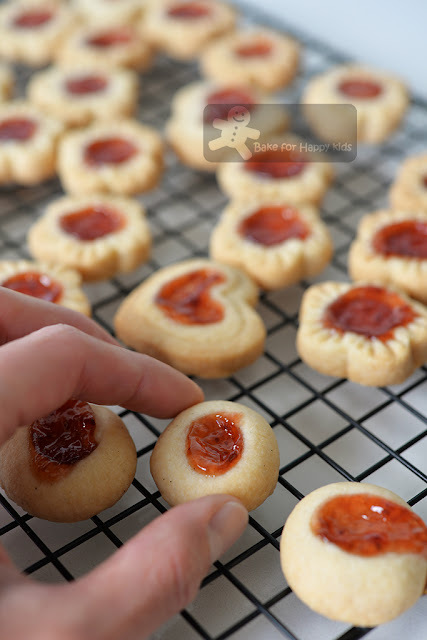 Use your finger or a small spoon or your jam cookie cutter to make an indentation in the centre of each cookie. Fill each indentation with about 1/6 tsp jam in each cookies. Roll tablespoonfuls of the dough into balls and place them about 5 cm (2 inches) apart onto the prepared tray. Flatten each ball to about 1 cm thick and 3 cm in diameter. Use your finger or a small spoon to make an indentation in the centre of each cookie. Fill each indentation with about 1/6 tsp jam in each cookies. Bake in the preheated oven for 15 mins for cookies with jam or 10-12 mins for cookies without jam, swapping the trays around halfway through baking, or until the cookies are lightly golden and cooked through. Important: Depending on the shapes and sizes of the cookies, please note the baking duration can vary slightly. Allow cookies to cool slightly on the tray for about 10-15 mins, then transfer to racks to cool completely. Serve and enjoy. Store any uneaten cookies in an airtight container at room temperature for up 2 weeks. Hi Yee, Top flour is finely high protein flour that is more suitable to make pasta, noodles or dumpling skins. Yes... you can use TOP flour to make these cookies but it will make them firmer and less melty. Cheers! Hi, what temp n time if i use airfryer ? Hi, I'm sorry that I don't have an airfryer and won't use an airfryer to bake cookies and cakes. Cheers!